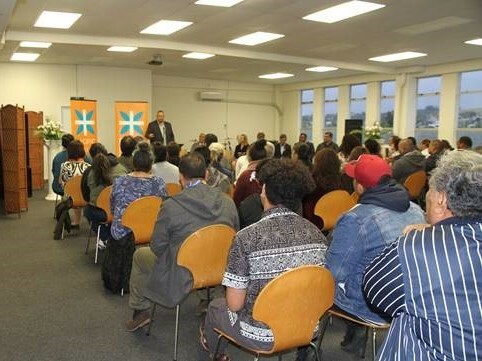 On Friday 5 April, more than 120 people gathered on a blustery Autumn night in a hall above a burnt out pub on Bedford Street in Cannons Creek, Porirua. They were there to hear about a ground-breaking project to change health outcomes in one of the most high needs Pacific communities in New Zealand. Auckland University's Maurice Wilkins Centre will team up with the only Pacific owned and governed health service in the Wellington region, Pacific Health Plus to address some very significant health problems faced by Pacific people. The partnership aims to work with the Cannons Creek community to further investigate research which has revealed that Pacific and Māori people have a gene predisposing them to heart disease, diabetes and obesity, and also to study impacts of sugar on youth. Attendees seemed excited to be part of something which will draw attention to Pacific needs, with a focus on improving quality of life and life expectancy. Also in attendance was the team from the Maurice Wilkins Centre, representatives from health and social service providers in Porirua, local church leaders, members of the Cannons Creek community and Pacific Health Plus board members. As the first speaker of the evening, Pastor Teremoana explained how the medical centre in Cannons Creek had been servicing the community for 10 years, and said that the time had come to take health services to the next level. Mike Tana, Mayor of Porirua said the evening was a "celebration of Porirua," and thanked everyone for their love of the city. He said this research project was a positive initiative for the area, with lives to be changed for the better. "Self-determination is the best way forward for communities, and this for-Pacific by-Pacific project is an awesome example of this," said Mr Tana. John Fiso, Chair of the funding body Fiso Group and Pacific Health Plus, thanked all those in attendance for their goodwill and help. "Data is important if we are to understand problems and determine solutions. It's critical that the research is owned and delivered by the people who will benefit from the outcomes," said Mr Fiso. Professor Peter Shepherd, Deputy Director of the Maurice Wilkins Centre commented on what a privilege it is to work with the Pacific community. He explained that the Centre's namesake Professor Maurice Wilkins was a New Zealander and Nobel Prize winner, and that throughout his career her had recognised the potential for New Zealand to use scientific research to achieve better outcomes for its citizens. “We have to move fast, we can’t waste time. We cannot assume that because medicine is tested on people in the US that it will work for our Māori and Pacific communities - we must look at how genetics influence this. We also need to harness links schools, communities and education to help achieve better outcomes. “I am excited about the opportunity Pacific Health Plus provides for the community to be part of finding the answers and creating the solutions," said Professor Shepherd.